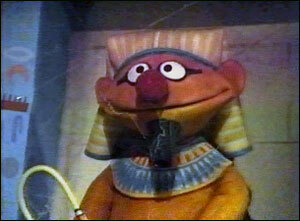 What do you remember about old school Sesame Street? Thread: What do you remember about old school Sesame Street? I remember the Canadian version of Sesame Street and it had different characters on it like Basil and Louie and one of them spoke french and there was a girl in a wheelchair and a cat named Chaos and an adventurer lady named Dodie. I also remember little scenes like these ones where children would put together a puzzle with someone and the song was in french. I remember when a piece was put in the puzzle correctly they would say yes in french and when they got it wrong they would say no in french and when the puzzle was put together it came to life. I also remember an animated one with hands and they would peel things away to reveal a picture underneath I think this was in french too. This series played on CBC Kids when I was younger I remember watching it with my little sister back when she was about four or five years old so 1996. I also remember watching the one on PBS as well I remember one episode in which Telly breaks his arm while playing with Elmo. It was really neat to watch the episodes that followed because at the time I had recently broken my arm and some of the things I could relate to like not being able to tie my shoes. I remember other things too the number rap, the aplha-quest, the teeny little super guy, the yip-yips and tons of songs. There was the no song, the one song listen to the heart of a frog, I know a new way to walk. I even remember the deaf lady Linda and Barkley too. (Invalid youtube)You mean, The one with the Androoze Sisters? Marsupilami: "No, Maurice! Those flowers were for your lady, Not your lunch! Now, What are you going to giver her?" the one where the girl imagines cracks on her wall coming to life. i remember the part with the crack master. I remember a counting segment where children were singing and counting the numbers in Spanish. I don't remember too many specifics about Sesame Street, only very vague blips here and there, Count Dracula's counting sessions, Big bird, Snuffleupagus, Oscar ,etc... Now Mr. Rogers show on the other hand, I watched this show a lot and remember way more details. Classic Sesame Street animation - 5 Crayons (CGI) Here is a rare 80's CGI insert from Sesame Street. That elmo wasn't in it every 5 seconds. I can't believe that no one has video for the "what about the boots" segment. With the claymation guy going to bed. I've searched everywhere. How did this not make it to the interwebs? He was called The Count. The weird animated shorts. My favorite has to be "Cracks", about a girl imagining the cracks on her wall turning into animals and such, and then the Crack Master appears...and destroys himself. "It's so heavily guarded, it might be the most dangerous place on the planet." The monsters were mean and scary like they were supposed to be, Bert and Ernie skits were actually funny and were regular. The animated short with the zerkle named Dan who ran past a big moving van and a large frying pan and got so hot he needed a fan. little guy on a shot glass, mr hooper, beginning middle and end song, kid playing with soap in the bath pretending it's a tug boat. Bert and Earnie. Just some random memories.